Virgin Galactic conducted a historic first supersonic test flight of SpaceShipTwo on April 29, 2013, in the Mojave Desert, CA. With all the attention being given to Virgin Galactic's impressive list of future celebritynauts (Ashton! Branson! Beiber! ), its spaceship's impressive capabilities for microgravity research have been largely overlooked. The private space plane, called SpaceShipTwo, is set to begin carrying passengers to the edge of space on suborbital rides in 2014. Already, 600 people have signed up for flights, including actors Ashton Kutcher and Angelina Jolie, singers Justin Beiber and Katy Perry, and Virgin Galactic's celebrity founder himself, Sir Richard Branson. SpaceShipTwo has 500 cubic feet (14 cubic meters) of interior space available for experiments, the most of any of the crewed suborbital vehicles now under development. The passenger cabin can fit the equivalent of 20 space shuttle mid-deck locker equivalents as well as a flight test engineer who will run experiments. For researchers who do not need to go all the way to space, SpaceShipTwo's mothership, WhiteKnightTwo, will be capable of carrying up to 30,000 lbs (13,600 kg) of payload on high-altitude flights. The carrier plane can reach altitudes higher than 50,000 feet (15 km) and linger for extended durations. This illustration shows four experiment racks and a seat for the flight test engineer in the cabin of SpaceShipTwo. "We may be able to accommodate smaller payloads on a case-by-cases basis, especially when those payloads are 'simple and safe' payloads that can be easily cleared for flight," Will Pomerantz, vice president of special projects for Virgin Galactic, said in an email. The cost of sending a payload aloft will vary depending upon several factors. 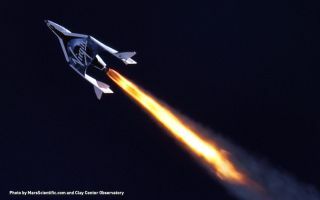 "The price associated with flying your payload on SpaceShipTwo will depend on several factors: particularly the size and mass of your experiment, the relative complexity of approving your payload for flight and of physically integrating it into SpaceShipTwo, and any special requirements you might wish to place on the flight time or flight profile," according to Virgin Galactic's payload users guide. Flying a simple, non-hazardous single cargo transfer bag or mid-deck locker payload would run around $50,000, according to the guide. "We would be open to allowing different experimenters to share the space of a middeck locker (or cargo transfer bag, et cetera)," Pomerantz said. "Additionally, there may be third party payload integrators that offer this as a service." Virgin Galactic expects that research missions funded by NASA's Flight Opportunities program will begin one to three months after the first commercial passenger flight takes place, which is now scheduled for sometime in 2014. Mixed tourism/research flights would begin the first year after commercial service begins. Four shuttle mid-deck lockers attached to an experiment rack inside SpaceShipTwo. Chartered research missions by single users and shared flights purchased by multiple experimenters would commence 18 months after the maiden commercial voyage. High-altitude research missions aboard WhiteKnightTwo are scheduled to begin in 2016. That same year, the company's orbital rocket, LauncherOne, is set to make its debut. The vehicle will be launched from midair by WhiteKnightTwo. Virgin Galactic says that as a startup company, it can't afford to provide funds for any experiments. However, the user's guide does point to three NASA programs that provide grants: Flight Opportunities, Game Changing Development, Research Opportunities in Space and Earth Sciences, and Hands-On Project Experience. Follow SPACE.com @Spacedotcom, Facebook and Google+. Original article on SPACE.com.